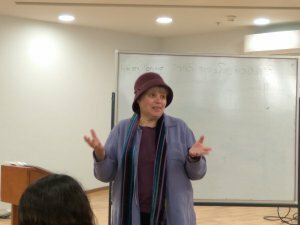 In signifying International Agunah Day, Dr. Rachel Levmore, the director of the IYIM Agunah and Get-Refusal Prevention Project, gave a 2-hour presentation in Bar Ilan University, at the “Midrasha”. The inherent difficulties of the divorce process in Israel, due to the intertwining of both democracy and Jewish law, was discussed, thus leading up to the problem of get-refusal. The prenuptial prenuptial “Agreement for Mutual Respect” for the prevention of get-refusal was presented and explained in great detail, turning all the participants into ambassadors for the signing of the agreement. The director was thanked profusely by both young and old, as they noted that the lengthy lecture was fascinating. Indeed the audience was glued to their seats, and upon leaving excitedly discussed what they had learned.